Robert and David played several golf matches against each other in a week. They played for a pizza at each match, but no pizzas were purchased until the end of the week. If at any time Robert and David had the same number of wins, those pizzas were canceled. Robert won four matches (but no pizzas), and David won three pizzas. How many rounds of golf were played? Eleven, David won 7 matches, 4 to cancel out Robert's 4 wins, and 3 more to win the pizzas. What do you call Jabba the Hut's older brother? Where do Pharaohs like to eat when they get hungry? What is green and sings and will be good on your pizza? What happens when you ask the waiter "will my pizza be long?" The will tell you "No sir, it will be round!" Found on pizza but also the sky. Youll know Im around when Im close by. What am I? A group of ten people are going out for pizza but only two of them have an umbrella to keep them dry. But they manage to walk all the way to the pizza place without getting wet. 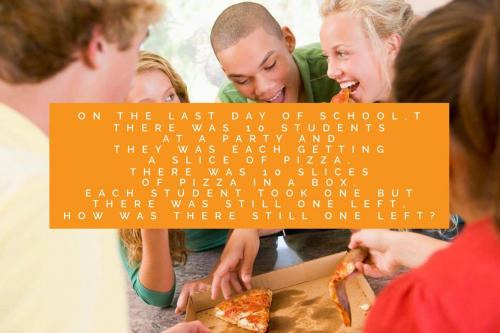 On the last day of school,there was 10 students at a party and they was each getting a slice of pizza. There was 10 slices of pizza in a box. Each student took one but there was still one left, how was there still one left? Each student took a slice but the tenth student took the box with their slice of pizza in it. 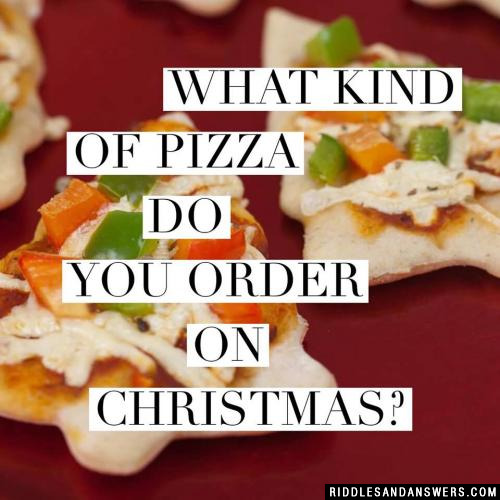 What kind of pizza do you order on Christmas? Can you come up with a cool, funny or clever Pizza Riddles of your own? Post it below (without the answer) to see if you can stump our users.